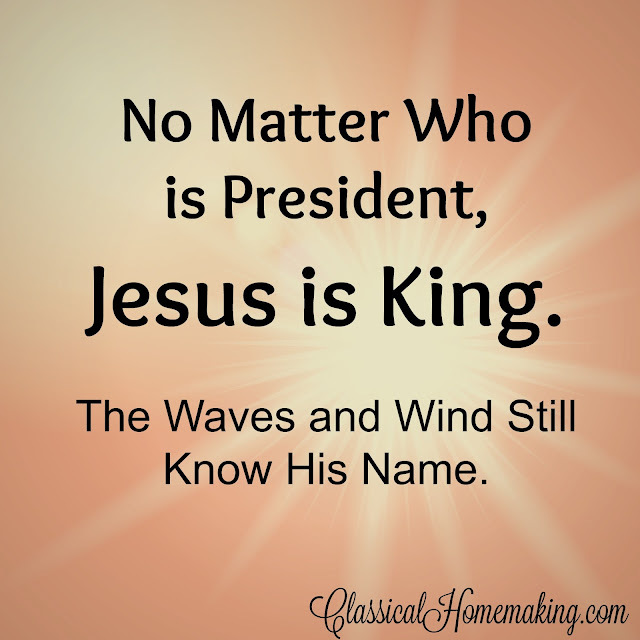 About four years ago, I wrote an article called, No Matter Who is President, Jesus is King. Obama was up for re-election and all was looking promising for him. My friends were losing it on social media, my husband and I had many worried conversations, "how can it possibly get any worse than it is?" Well, as many of you would agree, it definitely got worse. When I wrote that article, gay marriage wasn't a nationwide thing and Planned Parenthood wasn't exposed (and then ignored) for the illegal acts we are now aware of. "Obamacare" hadn't yet affected us all, and the lengths the President was willing to go to trample on our Constitution were not yet realized by most of us. Many conservatives chose to vote for the lesser of two evils---some (like me) chose to vote with their consciences and "threw away their vote" on a third-party candidate. Now we're faced with the very real possibility that Donald Trump could be President. Normally I'd encourage you stop and let that sink in, but many of us have tried and failed at that already. The Trump thing has definitely caught a lot of us by surprise and we've really got just a short time to stop reeling from the shock of it all and act. So my husband and I are back at the conversations---we've got all the solutions. I mean, if the three other candidates would just get behind Cruz, we could keep Trump out. The way we see it, that would totally solve all the problems of the universe and we'd all be living in peace, harmony, and complete prosperity by this time next year. Christians, the truth is something we already know---we just need to get it deep down in our hearts, as well as in the forefront of our minds. No matter who is President, Jesus is King. Last night, after watching videos of what the other conservatives had to say after the polls closed, I watched one of Trump's. It was only a couple minutes long, but in that time I was hit with something profound. As I listened, I found that I wasn't mocking him in my mind, I wasn't rolling my eyes and making sarcastic remarks, I wasn't begging and pleading with God that he'd somehow be knocked out of the race (usually these prayers involve a hint of murder---just being honest). Instead, I was listening to him. I was beginning to feel compassion. I was begin to accept this as a very real possibility and I found that I was beginning to be ok with that. God gave me peace. The me of yesterday morning would say I was being influenced by subliminal messages and selling out to the enemy---but last night I realized that Trump is not my enemy. Neither is Obama, for that matter. ...and here's where I stop. Because I don't know what else to say. I have absolutely no other solution to all of this than prayer. I've read 2 Chronicles 7:14, the "if the people who are called by my name will humble themselves and pray" verse. Did that. I know that Romans 13:1 says that God appoints our leaders. I understand that. But here's one that's new to my index of election-year verses: Many are the plans in a person's heart, but it is the LORD's purpose that prevails. (Prov. 19:21) This is the peace God is giving me during this time. Listen, we all know the time of Jesus' return is so close. The Bible tells us the world will be like it was in the time of Noah, that what seems right will be considered wrong and what seems wrong will be considered right. That's exactly what we're seeing today. One of these days there will be a ruler who will rise up and he will be the last ungodly ruler to ever be allowed in power. This could happen this year. Guess what's more---it could be any of the current candidates. It could also be someone we've never heard of. It could be generations from now---but I doubt it. The point is, it's going to happen. None of us can stop God's plan from unfolding any easier than we can stop the wind and waves. This should bring us peace, not fear. So let go my soul and trust in Him. Goodness, I needed that reminder. It boggles my mind how close we might be to Trump as leader of the most powerful nation in the world. Your post puts it all in perspective, and I can quit fretting. No matter how it turns out, He is still in control. I thank God for this post! Not only is it comforting during this election, but also (more so for me right now)for my current life situation. I am dealing with some health issues and an unknown future right now. I just had a good cry because you are right,"None of us can stop God's plan from unfolding any easier than we can stop the wind and waves". And thank you for the song. Thank you so much for this post. Wonderful perspective. Very good insight and attitude!